"A people without knowledge of their history is like a tree without roots"
Four years ago, in 2003, an envelope with a stamp postmarked Clonmel came up for auction in Sydney, Australia. It went for €42,000.00 and was acquired by Australia Post. The letter, reproduced here, written for James Walsh by a professional letter-writer, spent 30 years in a private stamp collection in America. The owner has shunned all publicity. 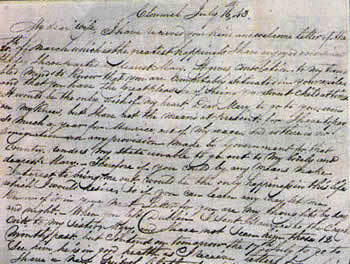 No one knows where the letter was kept between 1843 and 1973 or how it got to America. Although it was a stamp auction the contents of the letter, from James Walsh to his wife Mary, is invaluable for those seeking an insight to the hardship and heartbreak of separation common to Irish people in the 19th century. Mary had been deported to Van Diemens Land, now known as Tasmania, for stealing a piece of cashmere wool. She was 30 years old and had three children, the youngest a year old baby also named Mary. Despite petitions from her husband to the Lord Lieutenant appealing the severity of the sentence she was shipped out from Dublin to Hobart on a ship ironically named Hope on April 10th 1842. She took her baby with her. On arrival she was assigned to work for a free settler as a housemaid. Her baby was sent to an orphanage where she died two years later. I have received your kind and welcome letter of the 20th of March which is the greatest happiness I have enjoyed ever since the day I have parted my dearest Mary. It gives consolation to my troubled mind to know that you are comfortably situated in your exile and that you have the great pleasure of seeing your sweet child at times. It would be the only wish of my heart Dear Mary, to go to you even on my knees, but I have not the means at present for I have to pay so much a year for Maurice [son] out of my wages, and as there is no Emigration nor any provision made by the Government for that country renders my state unable to go out to my lovely and dearest Mary. Therefore if you could by any means make interest to bring me out would be the only happiness in this life which I would desire. So if you can learn any way let me know of it in your next Letter for you are in my thoughts by day and night. "...When you left Dublin I sent Maurice to the County Cork, to my sister Mary and I have not seen him those 12 months past but I intend on tomorrow the 17th July to go to see him, he is in god health as I receive letters from him. I have a new suit of clothes for him. Johny Hayes is in good health, along with the Prendergasts (near your Uncle Jack) in Service. I see him oftener than Maurice, for I do not leave Johny Hayes out of my memory at all, but give him every little thing that he wants. I am employed ever since you left home at Thomas Kennedys at Pass and at Thomas Rourks. My dear Mary there is not a moment but I am thinking of you day and night and will be always so til it pleases God to restore you once more to my arms for you are my only thoughts by day and my dreams at night. I am sorry my dear wife that I did not leave my children go out with you for I could be able to follow you in a short time if people were carried out free as they were before. I would go out to you when I received your Letter but they are not without a great deal of money if I lived for a 100 years you would be as fresh in my heart, as you were the day you left me. I expect a letter from you at every opportunity as it is the only pleasure I can enjoy, since my loving wife is so far away from me, it is my prayer morning and night to bring you safe to my bosom. I am glad to hear that my sweet little Mary is so well. My dear Mary, this is a broken hearted letter I am sending you as I cannot bring it myself. Send me word in your next letter if you intend to come home to me, when your time is out for I could not live at home without being in this place where my poor Mary used to be. I would send you another letter in a short time after this but fearing that you would remove from the place you are in at present.. Think of your broken hearted husband and children as long as you live. I am very well in health, as also are your children, all your friends are well. All the neighbours are well and very sorry for you, but I hope God will restore you once more to me and be happy together forever again. I will keep your Letter next to my heart until I receive another from you my darling wife. My dear Mary when I used to go to work every Monday morning from you I would feel the week a year long until I would see you on Saturday evening but what must my heart feel now when I cannot see you at all. For when I am at work, my labour cannot give me any concern, but thinking of you. My brother Jack and Maurice and families are well in health. My brother Jack lives now in the County Cork, in Mucroom, it troubles me very much to have my child so far from me, as it would be great comfort to my mind to see him once a week. I received your kind letter on 11th July which removed a mountain from my heart. Whenever you write direct your letter to Thomas Kennedy. All your neighbours send you […] blessing. I know my dear loving Mary that you will deserve the love and esteem of those with whom you live, as you have merited the goodwill of all who knew you at home. Now my dear wife as I am at the point of finishing my letter, farewell, farewell and may [you] receive as much consolation at reading of this as I have the reading of yours.May your rest be calm and your dreams sweet always thinking of him, who always thinks of you. Again farewell until I can shake hands with my darling Mary, until death do us part. I have offered a pound to Hennessy the writer if he could do anything for me by writing to the Lord Lieutenant." The fate of James Walsh? There is no record of Mary requesting passage back to Ireland: ‘It is unlikely she would have been able to afford it,’ Wishart notes, ‘and it was very uncommon for convicts to return. She possibly married again, quite illegally, but it was quite common to do so. 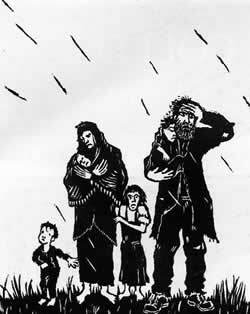 Two years after James Walsh wrote this love letter to his wife, Ireland was racked by the Great Famine. The fate of James Walsh and the two children that Mary was forced to leave behind is unknown.